The story of drip irrigation began somewhere in the late 1950s. An engineer by the name of Simcha Blass had his attention drawn to a big tree, growing in his backyard “without water”. After digging below the apparently dry surface, Simcha discovered why: water from a leaking tap was causing a small wet area on the surface, while an expanding onion shaped area of underground water was reaching the roots of this particular tree—and not the others. This sight of tiny drops penetrating the soil causing the growth of a giant tree provided the catalyst for Blass’s invention. The drip irrigation concept was born and experiments that followed led Blass to create an irrigation device that used friction and water pressure loss to leak drops of water at regular intervals. Recognizing the high potential of his discovery, he began to look for ways to turn his idea into a product. In the late 1950s, with the advent of modern plastics during and after World War II, he took a major step towards implementing his idea. The main aspect of the new invention was to release water through larger and longer passageways (rather than tiny holes) by using friction to slow water inside a plastic emitter. In the early 1960s, Blass developed and patented this method together with Netafim and the new dripper was the first practical surface drip irrigation emitter. And so it came about that a solution had been found for utilizing every water drop in the arid, water-scarce land of Israel. Amiran Zambia Ltd. pioneered the introduction of drip irrigation into Zambia. Approximately 15 years ago, drip was brought to Zambia primarily for the tomato growers and together with the use of the Israeli hybrid varieties, their yields were multiplied up to 100-150 tons per hectare compared to 30-50 tons with traditional irrigation methods and plant varieties. The coming year has been designated by Amiran to focus on and popularize the use of drip irrigation in Zambia. As Managing Director Mr. Yosi Karni states: “Amiran will work with like-minded partners in Zambia, using creative initiatives and focused efforts, to empower Zambian farmers with the most efficient irrigation method in the world – drip irrigation”. Although to the naked eye drip irrigation may appear to be just a pipe with holes punched into it, each outlet in actual fact has a complicated inbuilt mini-structure that causes a uniform quantity of water to be released. This water quantity does not change along the lateral line. The Drip outlets release different quantities of water, between 1 and 4 Litres per hour, depending on the size of the drip line. The unique structure of the outlet prevents blockages from sand or any other organic matter in the water supply although routine maintenance is required. Drip divides the water to all plants equally and enables control over accurate amounts of water that irrigate the plant. Other irrigation methods that do not offer such accuracy and uniformity will ultimately result in some areas receiving more water and some less which will produce an uneven crop and reduced yield. However, evenly dispersed irrigation will result in even crops and higher yields. Irrigating with drip may be spread over the course of a full day as the accuracy of dispersion is not influenced by winds, which is the case with sprinklers for example. When the wind blows water is blown with it creating uneven water dispersion. It is possible to plan the exact amount of water that will reach each plant according to requirements (based on plant age, size, number of plants per bed and plant density) without having wasted water that hasn’t reached its prime destination – the roots of the plant. The drip may also be used for Fertigation as soluble fertilizers are added to the irrigation water and dispersed equally among the plants through the drip lines. Introducing fertilizers through drip irrigation enables plant fertilization throughout the growth period. This ensures full utilization of the fertilizer properties as it is not washed away after being applied in large quantities i.e. only at the beginning of growth. Other fertilization methods do not provide such accurate nutrition and are not as effective as using drip irrigation for the application. There are also crop protection benefits to using drip irrigation. Most fungal diseases thrive in moist environments that are created by sprinkler irrigation. Drip is applied underneath the plant’s foliage which preserves dry surroundings. In addition, pesticides are not washed off the plants which ideally should be left on the leaves for as long as possible to prolong their effect. It is also easier to control weeds when irrigating with drip as the areas of the field between planted beds will not be irrigated and therefore discourage sprouting of weeds. 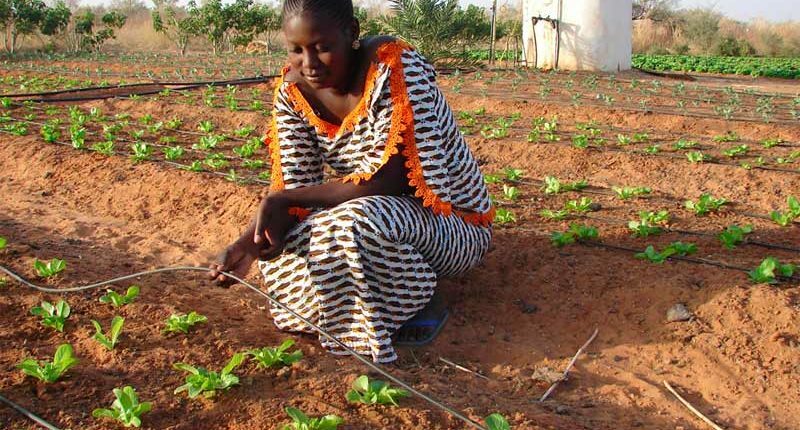 For the best possible outcome, drip irrigation requires good filtration to prevent blockages of sand and organic matter stemming from the water supply. The drip lines need periodic “washing” and by maintaining them properly, the advantages of this form of irrigation may be enjoyed for many years. After each growing season, the drip lines are rolled up and taken out of the field and this allows convenient cultivation for the next season with machinery and tools. In preparation for a new planting of either seeds or seedlings, the drip lines are easily reinstalled and the lateral line length may be adjusted as needed. Different drip irrigation specs exists for different crops and the correct type will be chosen in accordance with the intended crop. Distances between outlets will alter depending on the plant stands in the field (plant density in the bed) and soil structure. In sandy soil water is drawn down in a straight line almost and smaller distances between outlets is required to ensure enough moisture on the soil surface. In heavy clay soil, the distance between outlets can be larger as the lateral water conductivity is better in these types of soil. Drip is suitable for most crops and is most commonly used for line planted crops such as tomatoes, cabbage, cauliflower, peppers, watermelon, sweet melon, maize etc. It is also commonly used in tree plantations such as mango and citrus. Drip is not as suitable for crops with lateral root systems (such as onions) and those crops that are not planted in beds (eg. wheat).